James Gray is a director whose affinity for 70s New Hollywood films has always been obvious. The Godfather films are his most pronounced influence, and one could do far worse than to have those two movies guiding one's hand when directing. On its face, The Immigrant appears to be Gray's most blatant quote of The Godfather (Part II, specifically) yet. But it's how Gray subverts our expectations connected to that film that ultimately marks The Immigrant as his strongest film yet. The Immigrant begins in 1921 Ellis Island, where Ewa Cybulski (Marion Cotillard) waits in line with her sister Magda (Angela Sarafyan) to be processed for entry into the U.S. Separated from her after Magda is quarantined for tuberculosis, Ewa falls into the clutches of Bruno Weiss (Joaquin Phoenix) an opportunistic and mercurial pimp. Kind and endearing one moment, cold and callous the next, he deceives Ewa into believing that only by working for him and utilizing his connections in Ellis Island will she be able to ever see Magda again. Things get further complicated by Ewa's introduction to Orlando the Magician (Jeremy Renner), Bruno's charismatic cousin and rival, creating a bizarre sort of love triangle between the three. Where director Francis Ford Coppola used his Italian family lore to inform The Godfather films, Gray uses his Russian/Polish family history to fill out the details in The Immigrant. In one scene, a newly arrived Ewa is taken to a bathhouse by Weiss's coterie of women. One offers her a banana to eat, and it's obvious she has never seen one when she bites into it, skin and all, unaware that she needs to peel it. We also get the answer to the unspoken question of why Ewa is so desperate to stay in America, despite having to humiliate herself as a prostitute, when we learn that she and Magda witnessed their parents beheaded by Cossacks. But beyond the resemblance between Gray's use of personal details and Coppola's, there's the Gordon Willis-like chiaroscuro cinematography, the hushed intonations of the actors as they deliver their dialogue, the themes of brotherhood and cultural assimilation, all of which one can also readily identify in his previous films, The Yards and We Own the Night. (It's no coincidence that one counts James Caan amongst its cast and the other, Robert Duvall.) What marks The Immigrant as a departure for Gray is that it is the first time he builds a story around a female protagonist. This turns the Corleone assimilation success story of The Godfather Part II on its ear. For young Vito Corleone, adopting the killer instincts of those men in power he runs across is easier given that, as a man, he has access to a greater number of avenues in which to pursue his dreams of success. Not so for the female Ewa, who in fact sees her opportunities dwindle by hitching herself first to the hotheaded Bruno, then the smooth-talking Orlando, before being forced to return to Bruno. Bruno is another in a long line of twisted Caliban-figures Joaquin Phoenix has played for Gray. In this, their fourth collaboration, Phoenix has finally honed his interpretation of a loathsome (and self-loathing) antihero into something more by never failing to elicit empathy from the viewer in spite of his manipulation of Ewa and reprehensible preying on newly arrived female emigrants. Remember, burnished sepia tone or not, this is human trafficking we're seeing at a time before such a term even existed. Truly, The Immigrant is an ambitious step forward for Gray. Yes, he still hasn't completely left his devotion to The Godfather films far behind. 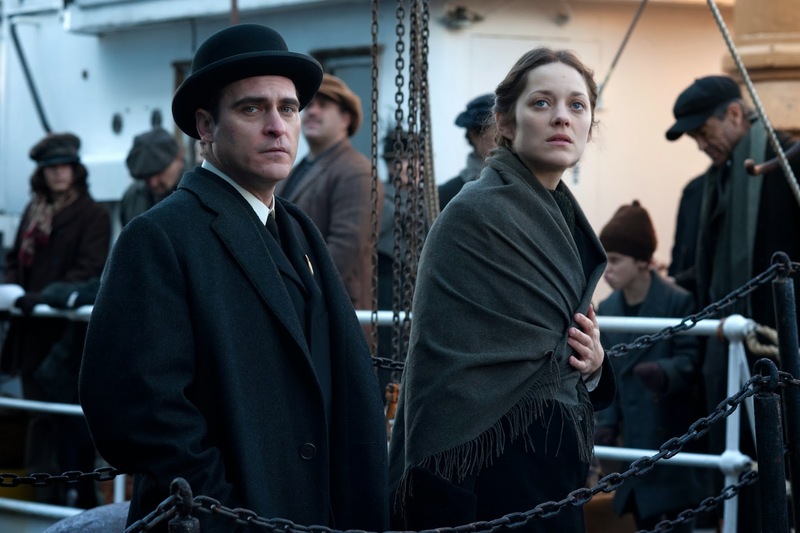 But The Immigrant is a poignant example of a film moving past simplistic imitation into the most transcendent kind of homage, one in which the premise of a beloved movie is exploded to create something completely other and new. The Immigrant is playing at the 51st New York Film Festival at 3:15 pm Sunday, October 6th at Lincoln Center's Alice Tully Hall, 1941 Broadway (at 65th Street), New York, NY 10023; and at 1 pm Wednesday, October 9th at the Elinor Bunin Monroe Film Center's Francesca Beale Theater, 144 West 65th St (south side between Broadway and Amsterdam), New York, NY 10023. At 2:15 pm Saturday, October 12th, the festival presents HBO On Cinema: James Gray in which the director will discuss his films at the Walter Reade Theater, 165 West 65th St (north side between Broadway and Amsterdam, upper level), New York, NY 10023. For ticket information go online here, or call (212) 721-6500. Looking forward to this one. Gray is always interesting. Hopefully, it makes it down this way.